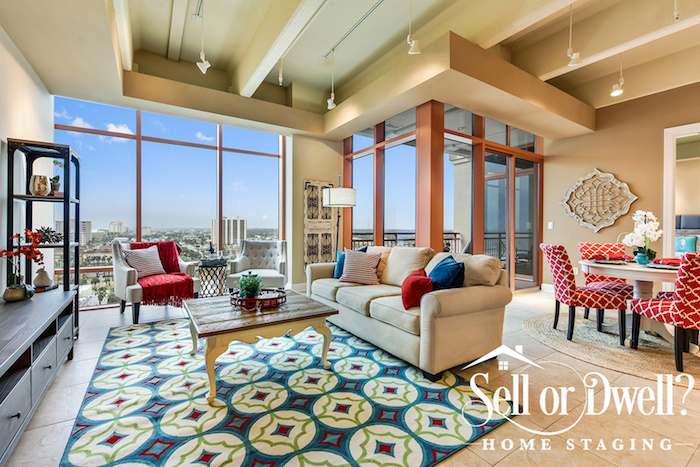 Sell or Dwell provides staging methods that focus on improving your home’s appeal by transforming it into a welcoming, attractive product that buyers want! Is your outdoor summer kitchen ready for guests this season? Summer has come, giving us an excuse to spend more time outdoors than indoors. If you have an outdoor kitchen, you can spend the entire day outdoors and even part of the night. To ensure your time outdoors is extremely enjoyable, give new life to your outdoor summer kitchen with these clever decorating ideas. Since you’ll be spending most of your time outdoors, it is only wise to have an outdoor dining area. An outdoor room is perfect for family meals and extends your living area. You can make the dining area elegant and fun by adding a fancy dining table, chairs, and lighting. Keep in mind that lighting will determine how the place looks – especially at night. If you want a casual look, don’t go for fancy lighting. If you want an elegant space, get elegant furniture and a chandelier. Another way to make your outdoor kitchen stand out is by using colorful chairs. You can get red dining chairs to give your exterior a jolt. Alternatively, you can use simple silver chairs and place a bright runner on the table. A big outdoor kitchen makes throwing al fresco parties a lot easier. If you love entertaining, enlarge your kitchen so that it can cater to a crowd. Add a mini refrigerator, a pizza oven, and other useful appliances that come in handy when cooking. If your budget allows, you can install a countertop that functions as a food prep area and a dining surface. Also get some garden umbrellas as they provide portable shed. But before you do, be sure to measure the sitting area. No outdoor kitchen is complete without a great grill. Even if you have limited space, you can still get a modern grill that will fit in the space. When shopping for a grill, look for one made of a high-quality material (like stainless steel) that can withstand harsh outdoor weather conditions. As you decorate your outdoor kitchen, always think of your cooking style as it will determine the appliances you get. For instance, if you only cook casually, all you may need is a grill island. However, if you are an experienced cook, you may need a smoker, a rotisserie, warming drawers, and much more. Get energy-efficient appliances as they will help you to save money in the long run. They may be more expensive than regular appliances, but they are worth it. Dining outdoors is no fun at all if your kitchen isn’t functional. If you neglected your kitchen during the cold season, now is the time to spruce it up. Decorate your outdoor summer kitchen and turn it into the perfect spot for entertaining. The post How to Decorate Your Outdoor Summer Kitchen This Season appeared first on . Hi everyone, I’m happy to announce that I’ve been nominated for the RESA Home Staging Industry Awards for Most Influential People. This isn’t an award for one person but a compiled list of influential people. The awards recognize and reward excellence in home staging and help influence how home staging is seen by the public. I’m honored to be Jacksonville, Florida’s only nominated home stager. I would be very grateful if you could take the time to vote for me. The voting button is on the upper-right side of the page. You can only vote once by clicking on the heart icon. Voting runs from the 26th of April up to the 29th of May Noon Pacific time. RESA will announce the industry’s Most Influential People in June. RESA is the biggest network in the country for professional home stagers. It ensures its members adhere to a strict code of conduct and always maintain professionalism and excellence. I am proud to be a RESA PRO®! Being a RESA PRO®, which means I have years more experience than most stagers, have passed a RESA exam, adhere to RESA’s code of ethics, and I am property licensed and insured. I’m very honored to be one of a selected few of stagers selected to present at the RESA National Convention (RESACON) which will take place in Las Vegas on July 2018. At the convention, home stagers will listen to and learn from home staging gurus. It is also a great event for those interested in becoming home stagers. I’ve had many great experiences this year. First, I was honored to be named Jacksonville’s new RESA president. I am also among just a handful of home staging instructors in Florida who are a RESA Approved Instructor. I teach a class titled “Staging to Sell: What Every Agent Should Know”. It’s perfect for Realtors who want to learn more about how staging can benefit their business. I’ve also grown my social media platforms to reach more home sellers, buyers, real estate professionals, investors and other professionals. Connect with me to learn everything about home staging and its ever-changing trends. I’m very passionate about home staging and I believe getting on this list will give me an opportunity to increase my scope and influence other home stagers. I would be honored if you would vote for me, please vote here. The post Would Love Your Vote: RESA Home Staging Industry Awards appeared first on . Home staging ideas can often be a challenge when you aren’t inspired! Spring is one of the best seasons for selling your home. The beautiful weather spells new beginnings, prompting home buyers to buy homes. Since buyers have many homes to choose from, you must make yours stand out from the crowd. Attract the season’s home buyers by using spring décor in your home. Brighten up your home with lively patterns, new motifs, and bursts of color. Sure, you can’t change your home’s location, but you can change the way it looks. Attract spring home buyers with these tips. Nothing says, “spring is here!” like fresh, colorful flowers and green plants. As plants and flowers pop up, bring some of that life into your home and usher in spring. Get some potted plants and put them on tabletops and countertops. They are beautiful and affordable and instantly liven up spaces. If you don’t have a green thumb, or the time needed to take care of plants, get plants that are easy to care for and need very little maintenance. Flowers are also a great way to add spring décor to your home. If you have a garden, you can gather flowers every few days, put them in vases, and display them around your home. Natural elements have the enchanting power of nature and give a home a relaxing atmosphere. A beautiful wreath can give buyers a great first impression of your home. You don’t have to go to the store to buy a wreath, you can make your own using spring flowers, twigs, berries, and other natural elements. To make your wreath more beautiful, you can add a ribbon and fragrant elements like dried lavender or cinnamon sticks. These will make your wreath gorgeous and welcoming. Some colors and patterns make us think of spring. In addition, there are new patterns and colors that come out in spring every year – so you have endless options. One of the best ways to incorporate spring into your home is with colorful pillows. Get spring-colored pillow covers for your living room and bedroom pillows. Don’t throw away the other pillow covers as you may need them in the other seasons. Cream and gray pillow covers – and other neutral pillow covers – can be used all year round. Don’t rush out to get new pillows for spring as you’ll have to get new ones for every season, simply change the pillow covers. During fall and winter, most homeowners hang heavy curtains and drapes to insulate their homes. When spring rolls around, it’s time to get rid of heavy window treatments and hang light ones that let light in. Hang sheers together with curtains and open the curtains during the day to let in the maximum amount of light. Sometimes, fresh window treatments can be the only change a room needs. When you’re trying to sell your home, every little thing counts. You can’t afford to overlook anything as potential home buyers will be sure to notice. Since spring has sprung, use spring décor in your home and entice spring home buyers. The post Home Staging Ideas: How to Use Spring Decor in your Home appeared first on . Exterior colors for your exterior home are essential. Color is a powerful tool that gets buyers attracted to a home. It also makes a home appear larger and more beautiful in your home selling photos. One of the best ways to update your home is by painting it. Paint is inexpensive and can instantly add color to dull spaces. It offers a good return on investment and helps homes to sell quicker and for more money. When painting your home’s exterior, here are some top exterior colors you can use. In the current housing market, you need all the help you can get. And if there’s one color that makes homes look great, it’s white. White makes spaces appear larger than they are, has a clean look, and soaks up sunlight. Also, since white is very neutral, you can choose a bright color for the trim and your home will still look great. White comes in many shades, so you can choose the perfect one for your home. Beige is a light, neutral, and safe color for a home’s exterior. It is the second most popular color after white. Beige paint gives a house a conservative look and goes well with landscaped or wooded areas. While some people consider beige dull and boring, the great thing about it is it sometimes takes on the attributes of the trim color. Based on nationwide paint sales, gray is currently the most popular color; it’s even more popular than white! It looks great both indoors and outdoors and is the go-to paint color for most decorators. There are many versions of gray – with beige undertones, blue undertones, or taupe undertones – so it is important to find the right shade of gray. A great alternative to gray is greige, a blend of gray and beige that looks good in most homes. Earth tones like green, orange, brown, and blue mimic the color of nature. They are warm and welcoming because they are muted and flat. They are also relaxing and soothing and work well with most colors. Earth tones go well with glass, metal, wood, or stone. Coffee is also a popular earth tone that can be highlighted with some whites, reds, and greens. Lighter shades of blue have a soothing effect because they make people recall the ocean, the sky, or beautiful, clear days. They can make people think of a ski trip or a beach holiday. A blue exterior can give potential buyers a good impression of your entire home. A word of caution: when choosing blue paint, steer clear of dark blue shades as they can make a home look dark and gloomy. While these are the top exterior colors, there are other things you should consider when choosing a paint color. First, consider the other homes in the neighborhood. If all the other homes are painted gray, don’t paint your house yellow – you’ll make it stand out for the wrong reasons. The color you choose should also mirror the landscape. Think of the trees and shrubs when picking a color. Your home’s exterior color determines how a buyer feels about your home the first time they see it. The post Top Exterior Colors to Use When Selling Your House appeared first on . This savvy investor took advantage of Sell or Dwell’s free design service. So, before rehab started, the designers at Sell or Dwell provided advice on key decisions such as paint color, flooring choices, etc. This saved the investor time and ensured that the end product was appealing to buyers. The result? The home was under contract in 48 HOURS! The average days on market for this neighborhood in the past six months is 58 DAYS! Staged listings sell faster and for more money. The post Vacant Staging – Orange Park South – Investor Flip appeared first on . Spring cleaning tips are really essential now that the real estate market is heating up! Spring is the busiest time of the year for real estate. It is also the best time to sell a home – whether it’s a seller’s market or a buyer’s market. This is because many homebuyers look for homes in the months of April, May, and June. With that said, most home sellers put their homes on the market in Spring so you have to make sure your home stands out from the crowd if you’re selling it during this season. Do some spring cleaning and spruce up your home. Here are some great spring cleaning tips. Your house may be sparkling clean but if it is filled with clutter, it will drive buyers away. Before you start spring cleaning each room, get rid of clutter. Set aside the items you want to sell (at a garage sale), the ones you want to donate, and the ones you want to throw away. After you’re done, put the things you’re keeping in their proper places. Decluttering doesn’t take a lot of time and can significantly change your home’s appearance. Clean windows can make a house look new. Wash your home’s windows inside out and wipe the sills. For a window-cleaning solution, mix a pint of rubbing alcohol, a teaspoon of dishwashing liquid, half a cup of sudsy ammonia, and one gallon of water. Choose a cloudy day to clean windows. If you clean them when it’s too sunny, the window-cleaning solution will dry very quickly and leave streaks. Remove items from tabletops, shelves, and dressers and dust them, as well as the spots they occupy. Spring is the best time to clean all the places you neglect throughout the year – like lighting fixtures and bulbs, ceiling fans, doorways, and baseboards. Dust lighting fixtures and bulbs with a lint-free cloth and ensure they are cool when you’re cleaning them. If your carpet is new, you may have to hire professional cleaners to do the job to maintain its warranty. If it is old, you can clean it yourself, as well as the rugs, using a deep cleaner. If you come across stains, use a stain-removal product to remove them. You can remove bad odors with baking soda. Sprinkle it and leave it for a few hours then vacuum it. Deep clean your floor or hire professionals to do the job. If your home has hardwood floors, they should be refinished. If it has tile or linoleum floors, they should be polished until they gleam. Bleach dull grout and paint the skirting board to make it look new. Spring cleaning tips don’t have to be hard! The post 5 Spring Cleaning Tips to Attract Homebuyers appeared first on . This home sat empty on the market for over 100 days. The buyer perception of this unusual floor plan was that it was small and not good for entertaining. The Sell or Dwell team staged the property and helped to define the spaces and show multiple seating and conversation areas – both inside and on the balcony (all with a direct view of the ocean!). The result? After staging, this beautiful ocean view condominium sold in 8 days for 98% the asking price. Staging Works! The post Vacant – Jacksonville Beach – Condo appeared first on . You may not know it, but home listings with professional photography can help your home sell quicker and for more money. These days, most homebuyers start their home search online. That is why listing photos are so important. They determine a home’s selling price, how quickly it sells, and whether it will sell at all. Here are 5 reasons why you need professional photography for your staged home. A great photo is captured at the right time, it’s all about preparation. A professional real estate photographer scouts the property days before the shoot to explore each and every angle of the home. They will examine the home’s light exposure, use both interior and exterior lights, and take a few sample photos. This will help the photographer to know which equipment to use during the shoot. A professional real estate photographer never skips this step. Real estate photographers usually know what it takes to capture the right images. They know the exact angles to use, the lighting setup, and even what staging is necessary to add a wow factor. You don’t need 500 pictures to sell your home, what you need are a few pictures that show it in the best light. Some professional photographers work with art directors to capture awesome photos. Home staging is all about positively influencing the buyer’s emotions. This is because emotions play a huge role in the home-buying process. An empty home cannot make buyers picture themselves living in it. A real estate photographer works with a home stager to rearrange each room before photos are taken. They remove personal belongings and bring in props which neutralize a home and ensure homebuyers are not distracted during a showing. If your home is empty, be sure to hire a professional home stager who will stage it using rental furniture. Just like paintings, professional photos must also be composed. The photographer determines the subject of the photo, the elements to be included, where to direct the focus, where to create straight and curved lines, and the best way to fill the space. Curves and straight lines can guide a homebuyer along an image and enhance a home’s appeal. During post-production, a photographer picks the best pictures and enhances them. They go through all the photos to choose the best ones to use. Generally, the best photos are those with plenty of space around the subject as they can be used for different purposes. After choosing the best pictures, a photographer edits them to ensure everything is perfect – the interior, exterior, sky, trees, and even grass. This may involve editing the paint and remove brown patches on grass. Many real estate agents claim to use professional photographers when taking pictures of their clients’ homes. But when you’re trying to sell your home quickly and for top dollar, not any professional photographer will do. You need professional real estate photography, as well as home staging, to make your home look stunning. The post Why Professional Photography is a Must for your Staged Home appeared first on . Who knows better about staging than anyone? Builders, that’s who! Just because you have a brand new home with updated finishes, doesn’t mean you should skimp on staging. Why do people LOVE model homes? Because of the emotional connection when they visit a professionally staged home! Sure, a builder could sell a home empty. But why sell empty when the ROI on staging is so great? This home had multiple offers with just 2 days on the market and sold for 98% of the asking price! That’s the power of staging! The post Vacant Staging – New Build – Oceanway appeared first on . Did you know that home staging services can actually be claimed as tax deductible on your tax returns this season? As a home seller, you can greatly benefit from home staging. According to the IRS, the money you spend on home staging can be considered advertising costs. Since the work of a home stager is to beautify your home for prospective homebuyers, the IRS sees the service as an advertising expense, provided that you hire a home stager for the sole reason of selling your home. The money spent on home staging is deducted from the sale proceeds of your home and lower the total realized profit. In a nutshell, the IRS considers staging costs as a legitimate expense for both secondary and primary homes and makes them tax deductible. However, it is worth noting that if you pay for home staging then take your home off the market, the staging costs will not be tax deductible. This means that staging costs are only deductible if your home is actively on the market. For instance, if your home is on the market and you pay for home staging and then you take it off and put it on the market, later on, the IRS considers these two to be separate transactions – so the first transaction is not tax deductible. If you pay for home staging the second time you put your home on the market, those costs will be tax deductible. What Home Staging Services are Tax Deductible? Since the words “home staging” have a tendency to confuse people, it is important to know what exactly is tax deductible. According to the IRS, these are the taxable home staging services. Contracting services depend on the circumstances and facts. Home improvements are not tax deductible but minor repairs done to get a home ready for sale are tax deductible. How the IRS Defines Home Staging Services? According to the IRS, home staging is what happens after you have cleaned your home, painted it, and conducted minor repairs. In essence, it is what the home stager charges for their services to prepare your home for sale. Things like carpets, furnishings, towels, and bed linen are not tax deductible because you will take these items with you after you sell your home. To sum it up, the tax deductible expenses are those included by the home stager in their invoice. Items that you buy and plan to keep are not tax deductible. The best way to go about it is to have your home staged perfectly from the get-go. Price it right and get it sold. To get more details on the tax deductions you get when you sell your home, check out this IRS publication. For more home staging tips take a look at our home staging services archives, here. The post How Home Staging Services Can Help Your Tax Returns appeared first on .